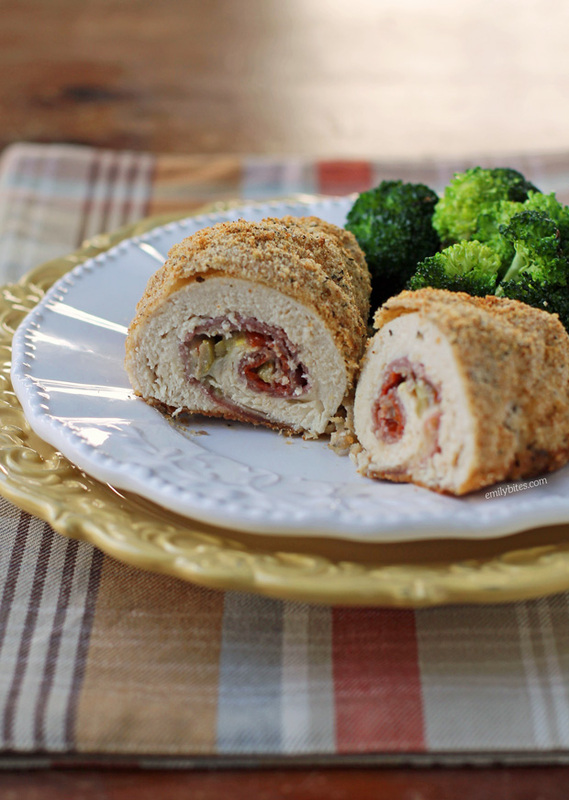 These Antipasto Chicken Roulades may seem like a bit of an oxymoron, but trust me, they’re a delicious oxymoron. 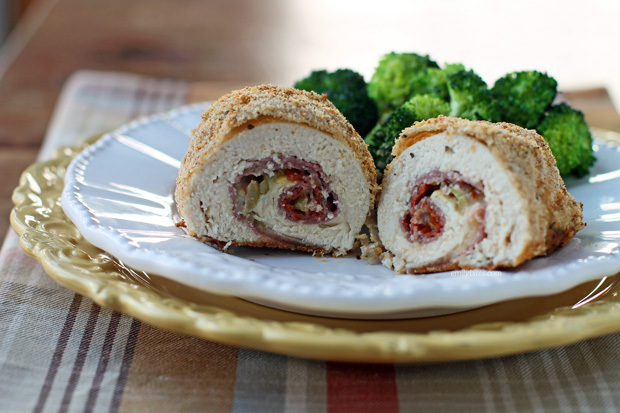 Antipasto means “before the meal,” so naming a main course “Antipasto Chicken Roulades” doesn’t really make sense. However, since I stuffed this chicken full of tasty ingredients typically found in a traditional Italian antipasto spread (cured meats, cheese, olives, pepperoncini) I decided to run with it anyway. Regardless of the nonsensical name, the flavors in this recipe make all kinds of sense. After we finished eating this dish I immediately started planning to make it again, it was that good. I decided to have this recipe serve two (perfect for date night – Valentine’s Day is coming up! ), but you could very easily double or triple the recipe to serve more. You may want to anyway since I was lamenting the lack of leftovers. Don’t be intimidated by pounding out or stuffing the chicken, it’s really easy! The recipe comes together pretty quickly so it’s perfect for a hectic weeknight meal. Looking for more ways to jazz up your chicken breasts? Try my Cream Cheese Stuffed Everything Chicken, Cheddar Ranch Chicken Tenders, Cheesy Bacon BBQ Chicken, Pesto Chicken Roulades, Lemon Pepper Iced Tea Chicken, Cheesy Chicken and Stuffing, Pizza Chicken Roulades,Thai Chicken Skewers, Chicken Piccata, Slow Cooker Buffalo Chicken and many, many more in the chicken section of my recipe index! Pre-heat the oven to 400. Line a baking sheet with parchment paper and set aside. Place the chicken breasts on a cutting board. Using a meat mallet, pound the breasts to a ¼ inch thickness. Divide the salami, prosciutto and pepperoni between the two breasts and layer them across the surface. Mix together the diced olives and pepperoncini and sprinkle over top the surface of the meats, Finish by sprinkling the shredded Mozzarella over the top. Starting with a short side, roll each breast up and seal the edges shut using a few toothpicks. Place the rolled and sealed breasts in a Ziploc bag and add the flour. Lightly flip the bag around until chicken is coated. Place the beaten egg white in a shallow dish. In a second shallow dish, mix the bread crumbs and Parmesan cheese. Remove each rolled breast from the flour bag and dip it in the egg white, turning to coat. Then move the coated breast to the breadcrumb dish and coat it with crumbs on all sides. Place the completed rolls seam side down on the prepared baking sheet. Lightly mist the tops of the breaded breasts with olive oil cooking spray. Bake for 30-35 minutes. Don’t forget to remove the toothpicks before serving!